Blurb:Rebellious crown prince Errol has committed the biggest sin, he's fallen in love with a male. As the son of a great goddess, Errol’s love affair with Simon has violated the social order--females rule and men must worship and love them alone. Childhood friend Shar has three days to save the love of her life, Errol, from certain death. When Errol and Simon approach Shar with a way to do that, she must rebel against her clan, her brother, and her entire way of life. Will she be willing to do the unthinkable and embrace this love at all costs? Review: I had a good feeling and a smile on my face while reading this story. I saw Shar as sort of a Wonder Woman character. Wonder woman lives on Paradise Island and men are inferior, Ms. Blues’s world also sees men similarly. Instead of a lasso and bracelets, there are crystals and powers. 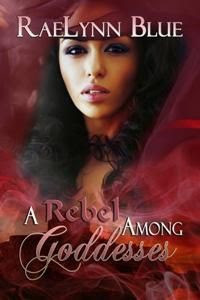 And while I make these comparisons, A Rebel Among Goddesses is still a unique and intriguing story. I found the sexual relationship between Errol and Simon touching and worth fighting for—oh yeah and hot! There were many characters introduced in this short story and I have to say there were times when that was a bit confusing but the story quickly goes back to the primary characters and the flow is smooth again. There are stirring moments, ripe with misunderstanding that amp up the tension between the characters. This also significantly contributed to the connection that simmers between them. You could feel Errol’s confusion, Simon’s fear for Errol’s safety and Shar’s fear of rejection. They all have so much to lose and yet, if they risk there is so much to gain. Can they have a future together or be shunned or worse dead? You’ll have to read the story and find out.